A new edition of The Intellectual Devotional, this time with a focus on American History, is now available in stores. (Click here to order your copy.) 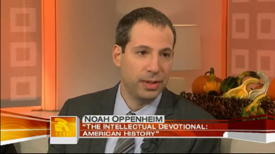 As well as continuing to expand on posts from the General Edition, “The Devoted Intellect” blog will introduce and expand on material from the American History devotional. Today’s entry on “John Smith” draws from the new book’s “Politics & Leadership” section. Though he was one of the most important leaders of the Jamestown settlement, a mercenary who had fought in numerous European wars, and an unlucky prisoner who had been sold into slavery to the Ottoman Empire (from which he escaped), John Smith is perhaps best known today for his connection to Pocahontas, the young daughter of a powerful Powhatan chief. The history is disputed, but the myth is a firmly entrenched part of American life and popular culture. The most recent depiction of the relationship between John Smith and Pocahontas is the 2005 film The New World. It is the fourth film by the American director Terrence Malick, who directed two classic works in the 1970′s – Badlands and Days of Heaven – before descending into a self-imposed obscurity, coming back to the screen with his 1998 film The Thin Red Line. The film focuses on the story of Pocahontas, and her transformation from an Indian princess living with a direct relationship to nature to an English gentlewoman with a keen sense of social propriety. The theme is handled quite beautifully, particularly because Malick never favors nature of society or vice versa: the naked American countryside and a manicured English garden are depicted as equally majestic. If you’d like to see the film for yourself, click here to order a copy. Years earlier, British children gathered around their “wireless” radio sets to hear the stories of A. A. Milne: the adventures of Winnie the Pooh, Tigger, Eeyore, and all the rest. One of the actors who played these characters on the BBC’s Children’s Hour was Norman Shelley. That same actor later claimed that is was actually he who delivered Churchill’s most famous speeches on the radio in the spring and summer of 1940. The story first arose in Churchill’s War, a 1987 book by the “historian” David Irving. Why the scare quotes? The story has not been substantiated otherwise, and Irving has been thoroughly discredited on many fronts. (He has spent a good bit of his career “arguing” that there were no gas chambers in Auschwitz, for instance.) It still pops up in the popular press from time to time, however, including this Atlantic magazine cover story from 2002. But serious historians, a category that cannot include Irving, no longer credit the idea. Sir Isaac Newton was one of the greatest scientists in human history. In the summer of 1665, Newton moved to a house in the suburb of Woolsthorpe to escape the devastation of the plague then ravaging London. (Cambridge University, where Newton had been conducting his studies, was closed because of the outbreak.) He stayed there until the spring of 1667. When he emerged, he had some discoveries to announce. While in a suburban cottage for slightly less than two years, Newton invented calculus (at around the same time that the German philosopher Gottfried Leibniz independently discovered it), discovered the universal laws of motion, formulated the law of gravitation, and built the foundation for the modern study of optics. It was a productive country vacation. As the writer Sam Harris recently put it, this may be “the most awe-inspiring display of human intelligence in the history of human intelligence.” Amazingly, this display was put on by a rather eccentric thinker whose interests ranged far more broadly than the modern sciences he founded. He was also a student of the occult. In fact, it was his occult studies that Newton valued most highly. He spent years trying to discover the secrets of “alchemy,” or the process (now known to be impossible) of turning lead into gold; he attempted to find hidden codes in the Scriptures; he made prophecies about the end of time. None of these studies came to anything, and Newton despaired and not discovering the secrets of the universe. A particular shame: few have revealed as many of those secrets as Newton himself. 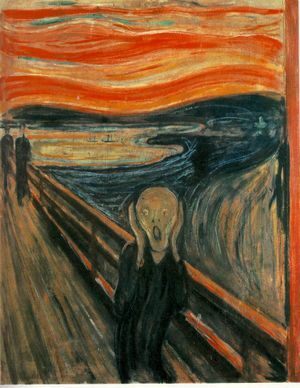 Though considered one of the most famous paintings in the world, “The Scream” by Edvard Munch is actually a series of paintings. The Norwegian artist made numerous versions of his famous work (including a lithograph for reproduction), though the work on cardboard shown above is probably the most famous. That version is in the National Gallery in Washington, D.C. Another (shown below) resides at the Munch Museum in Oslo, Norway. Both have been stolen. The National Gallery’s painting was stolen in 1994. It had been moved into the main lobby of the museum to commemorate the opening of the Winter Olympics in Lillehammer, Norway. With the entire world watching, the painting was stolen and offered back to the Norwegian government for a million dollars. 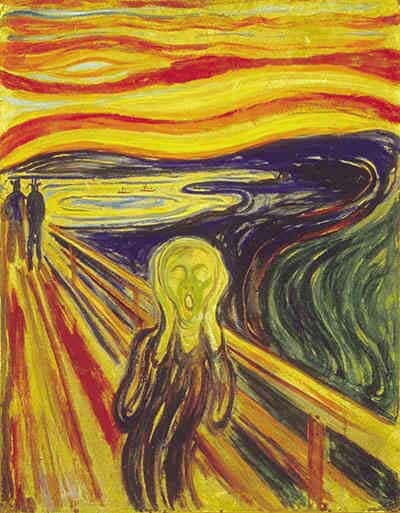 The Munch Museum’s painting was stolen a decade later, in 2004, along with “The Madonna,” another of Munch’s masterpieces. Armed thieves stormed the museum and made off with both works. This time, no ransom was offered, and it was feared that both works would never be seen again. Both works were recovered. The National Gallery’s painting was found unharmed a few months after it was stolen, and the Munch Museum’s paintings were recovered in 2006. Tragically, both paintings stolen from the Munch Museum were extensively damaged, and have not been restored to perfection. A new edition of The Intellectual Devotional, this time with a focus on American History, will be available online and in stores tomorrow. (Click here to order your copy.) As well as continuing to expand on posts from the General Edition, “The Devoted Intellect” blog will introduce and expand on material from the American History devotional. Today’s entry on “Pueblo Civilization” draws from the new book’s “Building America” section. Five thousand years ago, a star billions of miles from Earth exploded. This phenomenon, known as a “supernova,” is among the most spectacular events in the universe. Because the star is so far away, what we see when we look at the “Crab Nebula” (above) through a telescope today is what it looked like 4000 years ago. But 1000 years ago, when the image of that first celestial explosion reached the Earth, it was a far brighter thing (in a far darker night sky without the slightest hint of “light pollution”). Astronomers in China and Japan noted an extremely bright “guest star” that came and soon dimmed. And the Chaco people of what is today the Southwestern United States may have noted its first appearance in a remarkable stone drawing. 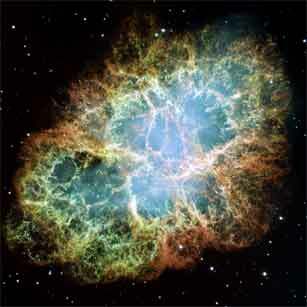 The supernova we refer to today as the “Crab Nebula” first appeared in the night sky on July 4, 1054. Around this time, somebody put three drawings on a cliff side of the Chaco canyon: a hand, a moon, and a star. When the moon is in the position pointed to by the hand, (a phenomena that occurred on July 4, 1054, and every 18 and a half years thereafter), the “Crab Nebula” is exactly above the spot where the star is drawn into the cliff. It could be a coincidence, but these simple drawings may in fact be a complex astronomical diagram. To read more about the “1054 Supernova Petrograph,” click here. A new edition of The Intellectual Devotional, this time with a focus on American History, will be available online and in stores on October 16. (Click here to pre-order your copy.) As the release date approaches, “The Devoted Intellect” blog will introduce and expand on material from that book. Today’s entry on “Slavery” draws from the “Rights & Reforms” section of the American History edition. One of the oddest things about the American Civil War was the reaction around the world. Leftists in Great Britain, for instance, often attacked the Union with far more vehemence than they expended on the Confederacy. As one pair of columnists put it at the time, “While they insult the free states of the North, they anxiously defend themselves against the suspicion of sympathizing with the slave states of the South.” Why did so many British liberals attack the North? For a simple reason: they believed that Lincoln was a hypocrite who didn’t actually care about slavery. He, and the North in general, was fighting the war for power and money. If he really cared about slavery, why not just separate from the South altogether? The pair who wrote the words above agreed, at least in part. Lincoln didn’t care about slavery. In fact, he didn’t realize how important slavery was to the conflict he was leading. But whether he realized it or not, slavery was exactly what the American Civil War was about. If Lincoln was going to win the war, he had no choice but to emancipate the slaves and fire the generals who were only half-heartedly leading the Union troops (because they sympathized with the South). They wrote those words in 1861, when none of this was clear. Three years later, everything they predicted came true. Say what you will about Marxism, Marx and Engels were brilliant journalists. Read all of their articles on the American Civil War here. Mark Twain is best known as one of America’s greatest novelists. Two of his novels in particular – The Adventures of Tom Sawyer and The Adventures of Huckleberry Finn – have secured his place in the pantheon of American literature. Remarkable as this is, it understates Twain’s achievement: he was not only a great storyteller; he was also a great journalist. Twain first rose to prominence with the publication of Innocents Abroad, his account of a trip through Europe and the Middle East. Greater fame came with the publication of his first major stories (beginning with “The Celebrated Jumping Frog of Calaveras County”), but Twain never abandoned journalism. In fact, he used his journalistic work to advocate for the cause about which he was most passionate: opposition to imperialism. His most well-known anti-Imperialist tract is King Leopold’s Soliloquy, a satire about the brutal of Belgian policies in the Congo. But Twain wasn’t only critical of imperialists across the Atlantic: he was also very critical when the United States began pursuing similar policies itself. From 1901 until his death in 1910, Twain was a prominent member of the American Anti-Imperialist League, along with the philosopher John Dewey, industrialist Andrew Carnegie and psychologist William James. Their major cause was opposition to American imperialism in the Philippines, which the United States acquired at the end of the Spanish-American War. He wrote an important work exposing the massacre of 600 Filipinos by the Americans, and never ignored the cause. Thanks in part to Twain and people like him, the Philippines regained its independence in 1933.  Click here and here to order collections of Mark Twain’s journalism from the Library of America.